Roofs which are not regularly cleaned of excessive debris build-up can develop drainage issues during foggy and rainy weather, and consequent roof damage. Debris buildup in key roof drainage areas such as roof crickets and roof valleys can lead to the formation of little "dams" in these areas, blocking water runoff and promoting the development of roof leaks. Blocked roof drains and rain gutters filled with debris also impede roof drainage during rainy weather, compounding the potential for roof problems. In addition, damaged, leaky rain gutters can deliver rainwater where it is not wanted: down into your home's foundation, where it can also cause water damage. At S&L Roofing, our comprehensive roof cleaning and rain gutter cleaning services will free your roof, drains, and rain gutters of all debris, and ensure that your roof can drain properly in stormy weather. 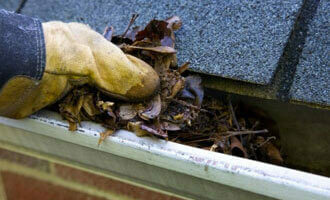 And our rain gutter repair services will ensure that this water ends up where it should - away from your home. Rely upon the experienced roofing specialists at S&L Roofing to design a roof cleaning and maintenance plan which will keep your home's roof draining properly in wet weather, and which will prevent costly roof repair expenses down the road. We have over 25 years of experience working in the residential roofing industry, and provide our affordable roofing maintenance and repair services to all of South Orange County. Contact us today. 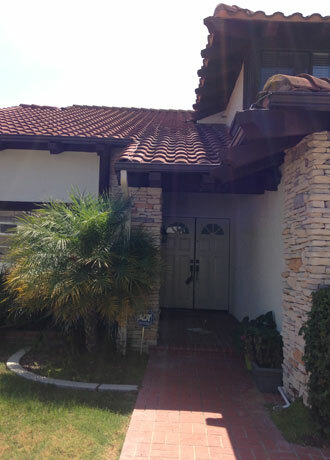 After: To repair this roof leak in Laguna Niguel, CA, S&L Roofing added new felt to the entire area of the roof leak, then carefully re-installed concrete roof tiles. The new felt protects the roof from further water damage, weathering, and much more.